Need a festive dish that can feed a crowd? Maybe something for Easter dinner, or a graduation party? Enter Braised Ham with Port. It’s more succulent than baked ham, and just as easy to prepare. Those who know only its baked cousin will be delighted to meet this dish. But accept your guests’ accolades with modesty. No need to ham it up. We use ruby port in this recipe, but you could substitute dry Madeira. Or red wine. Or even cider. How much ham to use? When using bone-in, we usually opt for half a ham. We generally select a shank half (it’s easier to carve), but you could use a rump half if you prefer. You’ll need about ½ pound of ham per person. And don’t forget: You’ll want some leftovers. Our recipe is influenced by one we found in All About Braising by Molly Stevens. Julia Child also has an excellent recipe in From Julia Child’s Kitchen. Prep time for this recipe is about 15 minutes. Cooking time adds another 2 hours or so, most of it unattended. Leftover ham keeps well for several days if refrigerated in an airtight container. Peel the onion, carrots, celery, and garlic. Roughly chop the first three; mince the garlic. Set all aside. Place a large Dutch oven or braising pot over medium stovetop heat (use a cooking pot that’s large enough to hold the ham comfortably – probably one that holds 6 or 7 quarts). When the cooking pot is hot, add the oil. When the oil is heated (it’ll shimmer – about 15 seconds), add the chopped onion, carrots, and celery. Sauté for 5 minutes. Add the garlic and sauté for 1 minute. Then add the thyme, the port, and the chicken stock. Simmer for 10 minutes. Add the ham to the cooking pot. Bring the liquid back up to a simmer. Then cover the cooking pot with aluminum foil, scrunching the foil down in the “empty” portions of the pot to help reduce the empty airspace above the braising liquid (this makes for a better braise). If the lid of the pot fits over the ham (it may not), cover the pot with it. Otherwise, crimp the foil around the edges of the pot to form a tight seal. Place the ham in the oven. If you’re using a cooked (“ready-to-eat”) ham, cook it for 1¾ to 2 hours (until tender and thoroughly warm). 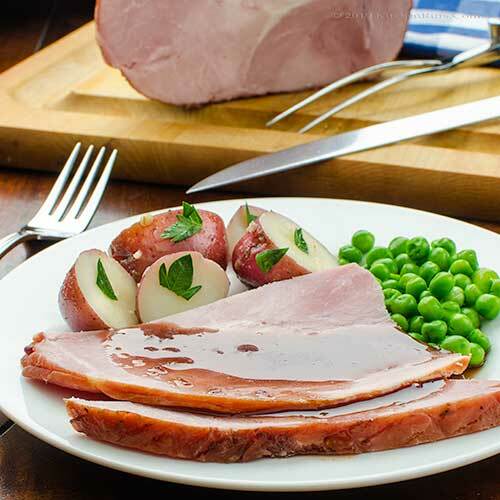 If you’re using an uncooked ham, add an hour to the cooking time (you may need a bit more time than that; the temperature of the ham should read at least 160 degrees when you insert an instant-read thermometer into the thickest point of the ham). 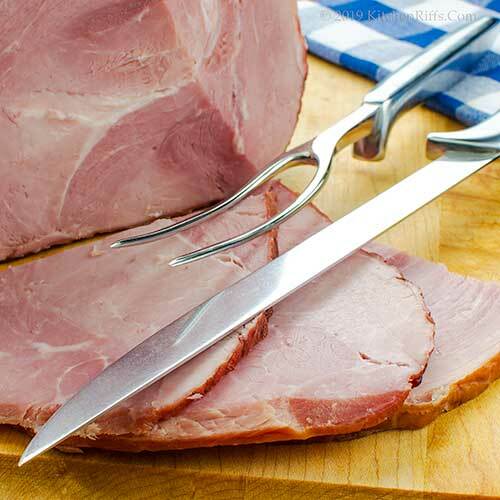 When the ham is cooked, remove it from the cooking pot and place it on a cutting board or plate. Cover the ham with aluminum foil and let it rest for 10 to 15 minutes. Meanwhile, pour the remaining contents of the cooking pot into a strainer placed over a bowl (to catch the braising liquid). Discard the veggies. Spoon off any fat from the braising liquid (or use a fat separator). Taste the liquid – you will probably want to reduce it somewhat so you can use it as a sauce. Be careful not to reduce it too much, though – the sauce could become too salty. Carve the ham. Serve with a bit of the sauce you made in Step 7. If using a half ham, you can place the ham flat-side down in the braising pot if you prefer (it often fits better that way). There’s no need to salt the vegetables when you sauté them (Step 3). Ham tends to be so salty that it provides natural seasoning. We like to use port as the braising liquid for this dish, but feel free to substitute. You could use Madeira, cider, dry red or white wine, or even beer. We’ve seen recipes that use sloe gin, which also sounds interesting. In any case, you’ll want to use 2 to 4 cups of braising liquid. We always add some chicken stock to the mix for extra flavor. Whole hams can be quite large – up to 18 pounds or so. That’s why we typically use a half ham in this dish. The shank half is easier to carve; the rump half tends to have better flavor. But ham always has so much flavor in any case that we’re not sure it matters much. So just use whichever half you prefer. Any meat that contains a bone will be more flavorful than boneless. But, again, good-quality boneless hams have plenty of flavor. What about picnic ham? Well, technically it isn’t ham because it comes from the upper part of the foreleg (the shoulder), rather than from the rear leg of the hog. Most hams you’ll see in the supermarket are wet-cured (these sometimes are called “city” hams). They may be smoked or not (we prefer smoked hams). Most supermarket hams are also “ready-to-eat” (that is, they’ve already been cooked). But occasionally you’ll find uncooked hams, which must be cooked before consuming. BTW, even when hams are sold as ready-to-eat, their flavor will deepen when you cook them. 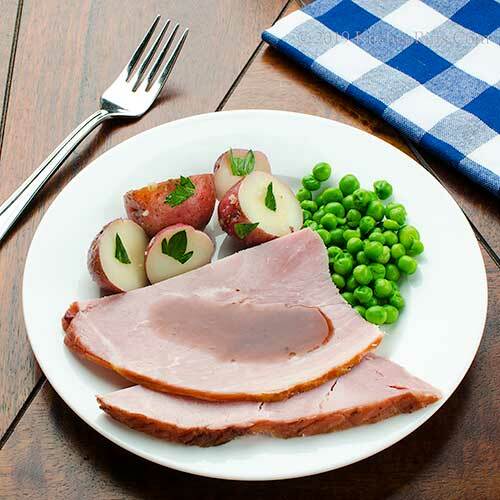 Prefer to use a dry-cured ham (such as country ham) in this dish? That will require some prep work: Scrub off any mold you find on the outside of the ham, then soak the ham for at least 24 hours, changing the water several times. Soaking helps remove salt (these hams are extremely salty). You can soak the ham for up to 48 hours. We use dried thyme in this recipe, but fresh rosemary would be wonderful. Or use any herb that you fancy. A bay leaf would also be a nice addition to the cooking pot. “Hope you didn’t pull a ham string thinking of that comment,” said Mrs K R.
“Is that how pulled pork got its name?” I said. I guess we have. Unless there’s a twist in the tale. Hi John, Perfect timing for ideas for Easter Supper. We have never used wine before in the mix but I am sure this makes the most delicious glaze for serving. Simply delicious. Wishing you a super week! Hi Bobbi, this dish has super flavor! And like the little sauce that the cooked-down braising liquid makes. :-) Thanks for the comment. What a great idea! I always have ham with honey butter but this looks amazing. Oh that sounds divine braised with pork. I am not a ham fan but I did a bone-in for a party and that was amazing. My choice cut. I love port but would have never thought to serve it with ham. What a delicious recipe John - thanks for sharing! Just in time for Easter! I love that you used Thyme! We haven't made a ham in far too long, and braising sounds like a great way to go. Thanks for the recipe and the tips, John! I have some leftover Madeira after making a cake - I wasn't sure what to do with it but now I know! This braised ham sounds fantastic - gosh, with this I don't think I'd even need a whole lot of sides! Thanks John! This sounds great for Easter, John! We just bought a Heavenly Ham, wish I would've seen this post first. But I want to try this next time, sounds delicious with that sauce. Those potatoes and peas look pretty good too, a meal fit for a king!!! Thanks for recipe! Hi Pat, that port sauce is delilsh! :-) Thanks for the comment. Hi Pam, honey butter sounds amazing too! :-) Thanks for the comment. Hi Evelyne, we go 50/50 between bone-in and boneless. Depends how fancy we want our carving job to be. :-) Thanks for the comment. Hi Tricia, port and ham is a wonderful combo! Really good stuff. :-) Thanks for the comment. Hi Ashley, thyme is one of our favorite herbs. :-) Thanks for the comment. Hi Terry, we don't do many hams either -- a LOT of meat for just two of us. So we always serve it to company. :-) Thanks for the comment. Hi Shashi, now you do indeed know what you'll be using that Madeira for. :-) Thanks for the comment. Hi Pam, peas (and potatoes!) are SO nice with ham, aren't they? :-) Thanks for the comment. This is so perfect for Easter lunch! The ham is perfectly prepared and looks amazing! Mrs. Kitchen Riffs is really lucky! Hi Angie, it IS amazing! Wonderful flavor. :-) Thanks for the comment. I have never thought is baking ham with wine, and I am loving the idea of it...I can only imagine how tasty it must be...thank you so much for the idea as we are getting ready for Easter ham. I hope you are having a fabulous week John! What a fantastic Idea and definitely perfect for a family feast over the Easter break. The port would offer a great depth of flavour, just lovely John. Hi Juliana, this is such a fun way to cook ham! Bet you'll like it. :-) Thanks for the comment. Hi Merryn, port is good stuff, huh? Perfect as a braising medium for ham! Thanks for the comment. Always have port in the house: in my case, prefer the tawny ! Have not baked a ham thus for a long time but have a few planned crowds in the offing who might enjoy! Shall take your methodology into the kitchen and peruse . . .fun trying . . . The ham is definitely the centerpiece of that dinner plate! None of this nonsense about mostly vegetables... serious meat. Hi Eha, tawny port is wonderful for drinking, but I think ruby port is the better cooking port. But is there ANY port that is bad for cooking? :-) Thanks for the comment. Hi Mae, serious meat indeed! Actually, that's a fairly small plate -- salad size. Better for photography, IMO. :-) Thanks for the comment. be yummy. Definitely not Grandma's ham!!! Hi Carol, braised ham isn't nearly as popular as baked. Too bad, because we find its flavor better. Must be the port. :-) Thanks for the comment. Your port sauce sounds incredible! This is no ordinary Easter ham!!! And braising is a marvelous idea---the results look moist and tender. I've always have port in the house, but have never used any with ham. What a fabulous idea. Madeira as well. A big step up from using coca cola. I know Nigella does it, but it's something I can't bring myself to try! Thanks for this recipe. Hi Natalia, it's a great Easter dinner! :-) Thanks for the comment. Hi Liz, the braising liquid makes such a terrific sauce! Super flavor. :-) Thanks for the comment. Hi Mimi, I've not used cola with ham -- does sounds interesting. Kinda. :-) Thanks for the comment. Great recipe John. 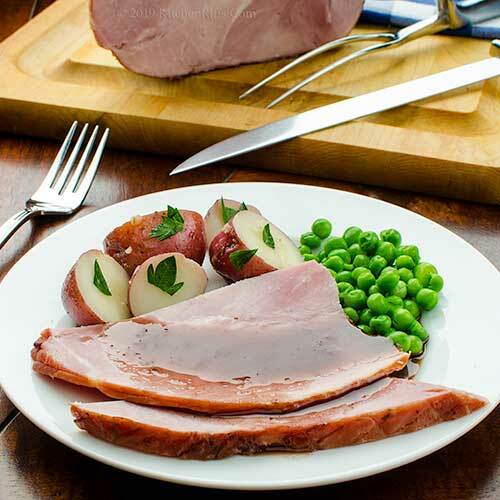 We commonly prepare ham in two different way over this way, boiled or baked. Your braising method blends the two so I say why not. So, with ham in hand, I shall proceed to the stove and braise my hamdsome bounty of pork. Hi Ron, you're in for a treat when you make this. :-) Thanks for the comment. I am not sure if I enjoy your recipes and how to's or the puns more! I've never made a ham before. I grew up in a kosher home and while I love ham I've just never made it. Bacon on the other hand is a different story. I personally don't keep a kosher home and love the sound of your Ham with Port. I think I'll have to give it a try. Your comment section is different. I'm not sure if my previous comment posted so I'm checking with this post. Hi Vicki, this really is worth trying. Just think of it as bacon. :-) And yes, changed to a different comment template. Google has been eating comments lately, and I'm hoping this comment template will work better (although I don't like the looks of it nearly as much as the previous template). Thanks for the comment. Hi Anne, hard to beat lamb! Although ham gives it a run for the money. And although we do the blog for the recipes, it's the puns that we personally find the most entertaining. :-) Thanks for the comment. I grew up eating ham at Easter but never had it served with such a delicious sauce. Hi Karen, ham isn't braised nearly enough -- such good stuff. :-) Thanks for the comment. I always went with a simple and traditional mustard or brown sugar or maybe apricot preserve style ham, but port sounds delightful with the fruity notes and robust flavor. Hi Laura, the traditional way is good, but sometimes a change is nice. :-) Thanks for the comment. John, that's a beautiful plate of food. Tell me about your carving set. Your carving knife handle looks like the handle of my steak knives I've had forever. Hi Jean, that was my parents' carving set -- don't know where they got it. And yes, this definitely is a beautiful plate of food! Thanks for the comment. Well THIS totally screams EASTER!!! And looks to be a total crowd pleaser too!! I am not surprised though, after all, YOU made ;) What I really want to know is what you do with the leftovers if you do in fact have any! Sandwiches perhaps? Hi GiGi, sandwiches are good, but we have a post featuring leftovers coming in a week or two. :-) Thanks for the comment. Looks so good, John! Makes me wonder why we don’t cook ham all that often! I can imagine that port sauce in several other things! Hi Greg, we aim to please. :-) Thanks for the comment. Hi David, ham is good, isn't it? Only downside is they are so large, the leftovers last a long time. Or maybe that isn't a downside! :-) Thanks for the comment. Hi Valentina, braised ham isn't nearly as popular as it deserves to be. A neat way to cook it. :-) Thanks for the comment. Oooh, now this is an Easter feast taken up a notch -- just the way I like it. Hope you have a wonderful holiday! Hi Carolyn, isn't this a fun dish! Love braised things! :-) Thanks for the comment. Port adds so much flavor to cooking. This recipe really amps up the flavor of a good ham, the leftover must be fabulous! Hi Deb, the leftovers were terrific! :-) Thanks for the comment. Hi Sonia, we'll keep on keeping on. :-) Thanks for the comment. I have never made a ham, probably because I never grew up with ham in the house. Now my parents love honey baked ham but I must admit I have never liked the texture of ham. Maybe it is because I've only had wet cured ham from the deli and the texture turned me off. I don't mind it cooked and in things but I'm just not a ham person. HOWEVER, I have no doubt that your preparation would change my mind! I love braised ham! It comes out so much more juicy than a dry roast... Yum! Hi Abbe, you might like trying a dry-cured ham. Much better flavor, but it's more of a pain to prepare (that soaking before you cook it). Thanks for the comment. Hi Frank, we don't braise ham nearly as often as we should! Such good stuff. :-) Thanks for the comment. Braising in ruby port!!! That sounds awesome! I've made marinades with ruby ports but have never tried braising. I bet the sweetness of the port and the salted of the ham create a wonderful flavor. A wonderful dish for the Easter table. Hi MJ, this is a totally awesome dish. Totally. :-) Thanks for the comment.